A 10-year, $15-million initiative, the CBTTC will be working to collect, store and distribute tumor tissue for more than 200 types of pediatric brain tumors. The Foundation has also directed funds to the Pediatric Low Grade Glioma Research program spearheaded by Dr. Adam Resnick. Learn more about the Pilocyctic Pilomyxoid Research Fund by reading the PDF below. The attached is a report on the Pediatric Low-Grade Astrocytoma Program prepared for Lauren's First and Goal Foundation. Dr. Timothy E. Van Meter, Virginia Commonwealth University, for project "A Molecular Signature of Pediatric Optic Glioma"
Dr. Avraham Dilmanian, Ph.D. at Brookhaven National Lab, N.Y., for the project titled: "Stereotactic Microbeam Radiation Therapy of a rat brainstem gliosarcoma as a surrogate for optic glioma"
LFG's donation was in support of the construction of Angel Field and pavilion, a retreat for pediatric cancer patients and families living in the Lehigh Valley. In partnership with the Leukemia Lymphoma Society, a resource library of disease specific books and educational materials was developed and is being provided to all newly diagnosed patients and families at the Lehigh Valley Specialty Care Hematology/Oncology Clinic. LFG donations continue to underwrite the expenses for families during Brain Tumor Week. 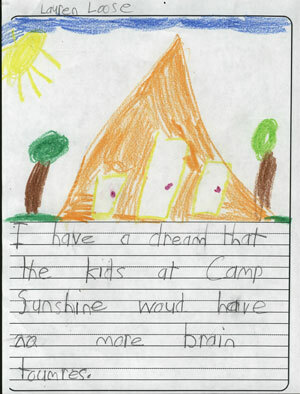 The foundation also sponsored the construction of a new volunteer housing suite at Camp Sunshine. This suite provides a permanent home for some very special volunteers, including Max and Rocky, who bring love and friendship to children and families during their visits to Camp Sunshine. This donation supports the continuation of the pet therapy and wellness programming at each camp session, and a permanent place for the volunteers who facilitate these services to stay during the sessions. 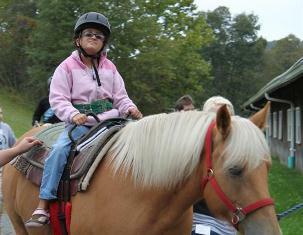 Camp Can Do is a week long camp for children in active treatment formerly sponsored by the American Cancer Society. In 2013, the national offices of the American Cancer Society decided to stop funding all camps. Camp Can Do has been in existence for 30 years, and is served by a dedicated corps of oncology nurses, doctors, and social workers, many who are childhood cancer survivors and former Camp Can Do participants. Recognizing the importance and value of the Camp Can Do experience, this group has filed for 501c3 status, and has partnered with Greta Glen Retreat Center to ensure that Camp Can Do will continue to operate, but will need to raise the necessary funds to do so. The program provides a normal, active and safe camp experience where children can celebrate life while living through their cancer journey. Campers explore the outdoors, swim, fish, boat, work with arts and crafts, and spend a day at Hersheypark among other activities. This camp serves a large contingent of children from our local Lehigh Valley Oncology Clinic. New in 2012, LFG will be providing the funding for a program of horse assisted therapy designed to meet the physical and emotional needs of children with cancer. The program will increase confidence, independence and responsibility; foster self-control, trust and empathy and improve balance and promote exercise and relation through interaction with horses. LFG's grant supported advocacy program initiatives and patient/family education programming. LFG's donation helped this organization grant more wishes for seriously ill children of the Lehigh Valley. LFG donated 60 copies of Hope is Here to Stay to pediatric neuro oncology treatment centers and pediatric cancer service organizations across the country. These were underwritten by a donation from Frank and Holly Santoro. Founded in memory of Kyle D. Kerpan, this program serves the patients and their families at the Children's Hospital of Philadelphia oncology clinic. Kyle's Peace organizes monthly visits to the facilities that include various activities, comfort services, monthly parent support group meetings and even yoga. LFG helps this organization provide monthly patient/family/caregiver support groups as well as physical and recreational activities for pediatric cancer patients in the Lehigh Valley. LFG's grant supports this program that coordinates animal visits for children and their families staying at the Ronald McDonald House. This grant supports the Philadelphia Ronald McDonald House Chestnut Street Adopt a Room program for 2016 and 2017. The house is a home away from home for patients and families traveling to Philadelphia for care. In 2014 the house provided a comfortable and caring place to stay for over 1300 hundred families from 44 different states and 18 countries. LFG's donation will help Splashes of Hope transform the bare walls of healthcare facilities into a comfortable, friendly atmosphere for patients, hospital staff and visiting family members. Creations are designed to stimulate the healing process by giving patients a soothing visual focus during their hospital stay. The financial strain of a cancer diagnosis can present a tremendous challenge for families and caregivers. Families can apply for financial assistance for uncovered medical, housing, utility and funeral expenses through the oncology clinic social workers who work with the foundation to ensure that requests are valid and appropriate. In 2018, the foundation made 44 payments and provided gas and food assistance to families dealing with a pediatric cancer diagnosis. Lauren participated in the pilot program of the equine-assisted therapy now being sponsored as part of this year's grants. Lauren with the Director of Pediatric Neuro-Oncology at Children's Hospital of Philadelphia, Dr. Peter Phillips. Lauren's First and Goal has donated $141,250 to Camp Sunshine. Lauren's First and Goal awarded $31,000 to Angel34. Lauren's First and Goal has donated $1,500 to the Vet Pets program.